A lot of racing games offer great graphics and animation, they can oftentimes leave you bored after a while, with stale game play. 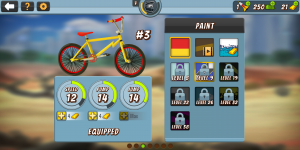 Mad Skills BMX 2, from the developer Turborilla, challenges that notion with a free, family-friendly title that I keep going back to again and again. 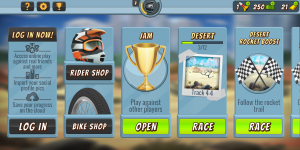 Check it out and see if it’s a racer you would be interested in. 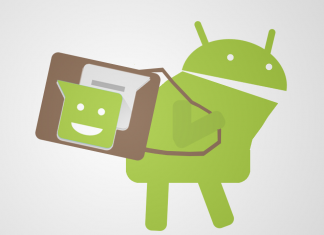 Setup couldn’t be simpler: just download from the Play Store, click on the icon, and you’re in. From there you jump into some short tutorials, and then you’re into the meat of the game. 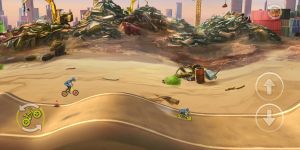 Mad Skills BMX 2 is a sequential racer, meaning it’s kind of like a campaign; your racer progresses through the game by beating each level (and your AI opponent) in sequential order, not moving to the next level until you “win” the current one. You are given several “worlds”, or track series, with multiple specific tracks within each. Like a campaign-style game, the first levels withing each series start out easier, but progress in difficulty as you go along. 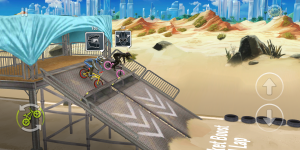 One of the reasons Mad Skills BMX 2 is so fun to play is its nuanced use use of game controls and course challenges. 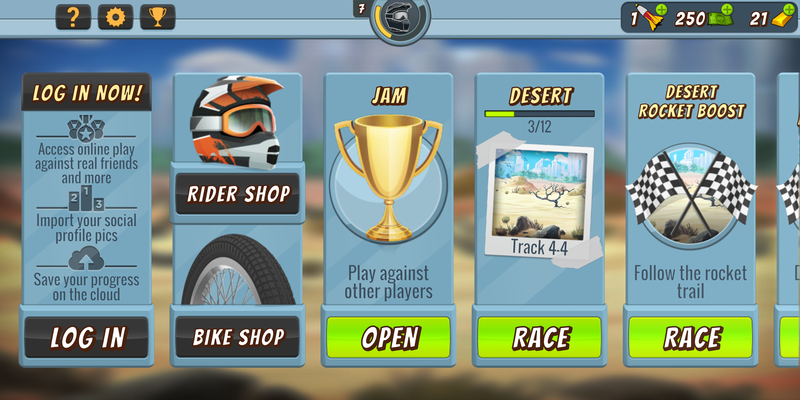 To race your bike, you only have two main controls: up & down arrows on the right side of your display. The down arrow lets you pump or wheelie down hills and over whoops faster, and the up arrow let you bunny-hop, which helps get more air off ramps and other jumps. That’s it for controls. There are a couple of other buttons available (rocket button for a limited turbo boost, flip button to do backflips), but they don’t affect the core gameplay. The key is your timing in your approach to each dip, whoop, bump, and ramp on each track. Each of these obstacles provide their own challenges, but the almost endless combination of them provide the equally almost endless challenge in mastering your touch & timing. Getting to a point to beat my opponent, and the intense satisfaction that comes with doing so on each level, was more than enough to keep me coming back for more. This is a true case where simplicity and nuance brings much more to a game than a clustered collection of controls and options. 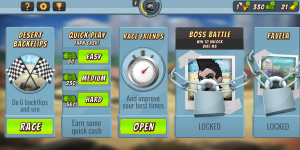 One of my favorite part of the game is that it allows you to play previously-beaten levels/tracks, racing yourself as you best raced it last, trying to create new personal records. Clothing/helmet upgrade: This is aesthetic only; can’t say it appealed to me that much. 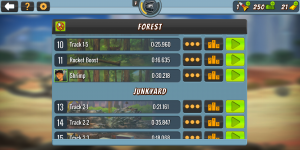 Bike upgrades: You can upgrade your general speed, your pump ability, or your jumping ability. New bikes: The holy grail! With enough money collected you can switch out to a completely new ride (complete with speed, pump, and jump attributes to fill out as you go). If I had one disappointment, it is with the amount of ‘boost’ each upgrade gives you. I really couldn’t see or feel the difference after dropping hard-earned money for one or more attribute upgrades. I would appreciate it more if more impact was given to these. 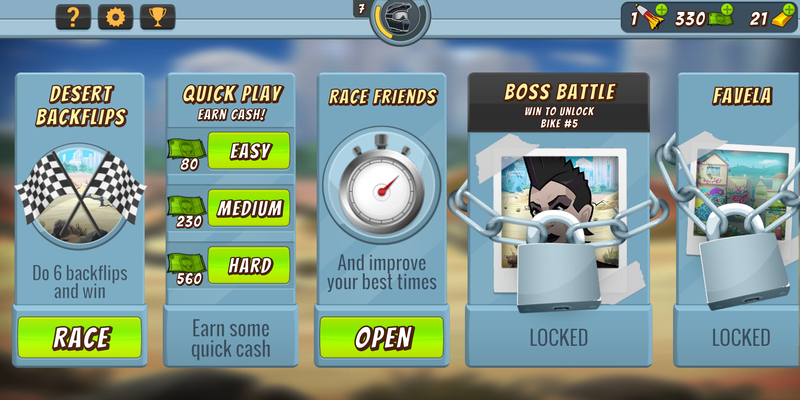 You do collect rockets from time-to-time….these allow you to hit the icon for a short-term turbo boost in a race. These are pretty rare (provided you’re not paying real in-game cash for them), so you need to take care in using them up. Believe me, they go fast! It sounds odd, given the lack of crazy controls, gameplay, and other game mechanics, but Mad Skills BMX 2 is a rare game I enjoy playing more than a few days before moving on. It’s still on my device, and I say it should be on yours, too. Download Mad Skills BMX 2 from the Play Store. 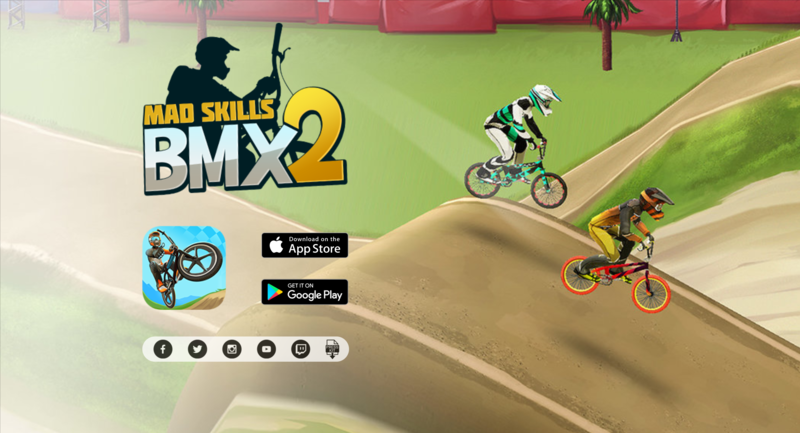 Mad Skills BMX 2 gives you a true BMX racing feel, with simple but nuanced controls that allow you to put your own touch on the way you choose to race and win.